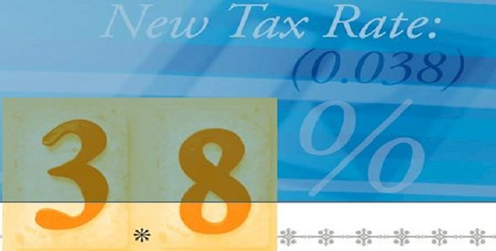 On January 1, 2013 a new 3.8% tax was introduced as law and is a part of the presidential Affordable Care plan. It created turmoil because of misinformation of public and homeowners about the details of the law. This new tax is imposed among other things on real estate transactions and other income generating activities. It is separate from income taxes a taxpayer has to consider. What does the tax apply to? Individuals with Adjusted Gross Income (AGI) above $200,000. Couples filing jointly with AGI above $250,000. When calculating the tax, the new formula calls for applying it to the excess of AGI based on filing criteria or net investment income amount, whichever is smaller. It therefore shelters significant portion of earnings from taxation. Homeowners who sold a house where they lived for 24 months during a 60-month window can still apply exclusion amount of $250,000 for individuals or $500,000 for couples filing jointly. Only the amount above those numbers enters into calculation of potential 3.8% tax potentially affecting higher end real estate transactions and investments. Assume a couple filing jointly decided to retire, sell their property, and move elsewhere. Their income was $120,000 (that includes wages, interest income, and dividends) and they sold the house for $900,000 (they live in California). They bought the property few decades before for $250,000. So how do the numbers add up? AGI before home sale: $120,000. Gain on home sale: $650,000 ($900,000 – $250,000). Less $500,000 exclusion: $150,000 Taxable gain. New AGI: $270,000 ($120,000 AGI+ $150,000 gain on home sale). Excess of AGI over $250,000: $20,000. The gain on the sale of property was $150,000 and the excess of total income over $250,000 was $20,000. Since the tax is assessed on the lesser of the two, the taxpayer is responsible for $760.00 in tax payments, which is 3.8% of 20,000. The National Association of Realtors created a set of examples to show tax consequences under different scenarios. It discusses tax consequences when selling a principal residence, second home with no rental use, non-real estate asset, capital gains, dividends, interest, rental income, inherited property, and investment property. See those examples.